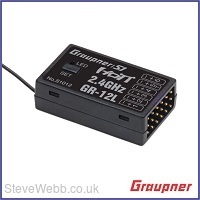 Graupner's most affordable 2.4GHz full range receiver with built-in telemetry, the Graupner GR-12L 6 Channel receiver is small sized and lightweight, lending itself very well for small park flyers, lightweight hand launch sailplanes, helicopters and multirotors. The ultra-low voltage requirements of the GR-12L allows it to operate on a single-cell LiPo making ideal for DLG gliders. The GR-12L provides real-time bi-directional data transmission of critical system health datalike temperatures, receiver voltage and signal strength using the Graupner HoTT protocol providing you with telemetry information you need for a safe and secure flight.